When a person isn’t currently employed and they are searching or looking out for a job, they may or may not get one. If the person is still looking out for a job, then no job leads the person going into a depression. Their mental health starts getting troubled as their income is reduced. This will eventually affect their livelihood and this starts to trouble them. But as per researchers, financial strain as well as loss of personal control is the leading culprits that lead to major depression. When the person starts realizing that job hunting is taking much more time than they expected, then the actual job search depression begins. And at times, the consequences of losing a job that the person had previously leads to jobless depression. So when the person identifies the causes as to why such depression is being caused in their life, the sooner they can find a solution of dealing with depression. 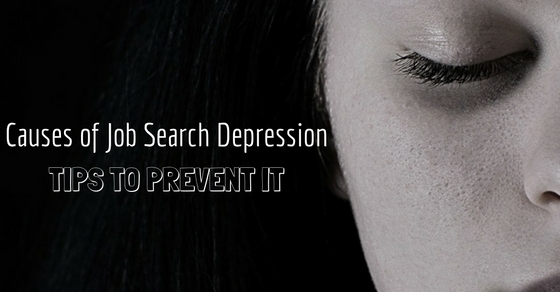 Below mentioned are few reasons for depression and tips on understanding depression situations. The person had a job some days before and currently is unemployed. So the individual starts to think deep about this and it starts worrying their life to a greater extent than expected. They start to see that this is a sudden and a traumatic change in their life at the moment. And they start to realize that they cannot handle this kind of pressure at the moment. Therefore, due to so much worrying they go into career depression because of their unemployment. Here unemployed and depression are interlinked and is the main depression cause. When a person is unemployed, there is uncertainty in their life. This uncertainty is constant in nature as they do not know when or if they will ever be employed in their life once again. Due to this, they start to also think if they will never be employed again; it means that they do not know when their struggle to find a job is going to end. Due to this, uncertainty is also another major cause which leads a person into going into a depression regarding their job. Looking out for a job is like a quest for the individual. It is a quest which they have to achieve in their life so that they can live their life in a happy and content way. Till they do not get a job they will not entirely complete this quest for acceptance what they are looking for. So as the job search is delayed further and further, it leads to depression inside the individual. So as this quest for acceptance is ever continuing for the individual, the depression also continues to go on further. Commiseration means some sympathy and sorrow given by a person for someone else’s misfortunes. In other words it is compassion given by someone else. When a person is looking out for a job, they do come across other job seekers also. If they come to know that the person still hasn’t got a job yet, then they try to provide some kind of commiseration to that person. But sometimes that is entirely backfired which leads to the person getting further more depressed about job. A person looking out for a job will naturally send out their resumes along with their cover letters. At this time reply may be positive or negative. When it is a negative one, it means that there has been an insignificant amount of replies back from the employers. When this happens, the person will start feeling bad about themselves. They start thinking that they aren’t fit for the job and this leads to them going into a depression due to this kind of feeling. The person looking out for a job is a desperate person. They won’t just send out a resume to a single company, but they will send out to multiple companies of their interest. But at times when the replies come back, it can be negative. The ratio of the number of negative replies will be more than any positive replies. With so many rejection letters, the person starts getting stressed out which in turn leads to depression due to rejections in their job searching. For some people, this time being unemployed may be their first ever time. As this is a new experience for them, it will be even more difficult for them to handle such a situation. Stress and depression of not having a job comes for every individual. But for a person who has gone through such a situation before, they will find it not so difficult in comparison to a new person. So such an individual new to being unemployed needs to go through even tougher challenges than they expect. When the person is unemployed, they have no other choice other than looking out for a job. So they know that they do not have anything much to do in their professional life at the moment. This starts bringing in fear within the person. This fear corners them into a tougher situation in their lives which they have to experience. So with no other choice left, they start getting stressed out and this stress turns into a depression for them. Going back to the schooling days, how to handle certain situations have been taught before. But such a situation of a person being unemployed has never been taught before for the person. At this moment, the problem of being unemployed suddenly comes in their lives. So they start getting uneasy and they know that they have to come with a solution as quickly as possible. Thus such uneasiness and nervousness develops stress and ultimately leads into depression. The personal expenditures that occur on the life of the person solely depend on the monthly income they receive. When they are unemployed they have no other source of income. So for them to manage all their personal finances, it becomes a very difficult and stressful task. At some point, they may not even meet all their expenditures at that moment. Thus as the personal finances of the individual cannot be managed further, they slowly start going into depression. Most of the people who work professional jobs work for the purpose of supporting their families. Fulfilling every member’s wishes is what they think about and keeping everyone happy. They know that at this moment as they are unemployed they are going through a rough moment in their life. Thinking about all their further family tensions they start developing stress in their minds. This stress of job search anxiety starts changing into depression being one of the major causes. When the person is unemployed not having a job in their hands they have nothing more than thinking about when they will get employed later. Slowly this waiting game starts turning into a depression while job searching is going on. The stress causes the person not to think straight at times also. So the person may not even realize that their current situation and its stress are turning into a depression for them. So not realizing that this is happening is their major problem. When a person is still unemployed even after sending hundreds of resumes to companies, it means that the companies aren’t interested in hiring him. This is a feeling of depression for the individual. These feelings are very difficult for the person to handle at the moment. They have to also keep their mind and their mood cheerful. This would be so that if they receive an interview then they remain upbeat for it. The difficulty in handling such feelings leads to the depression to continue in the person’s life. The person will have their family as well as their friends around them. They would see how all of them are carrying out their lives and enjoying it. They would see them going out for get together and out for vacations. At this moment, the person starts to think that they cannot enjoy and provide their family once again in the same way if they do not get a job soon enough. And they would start seeing that while everyone is going out on vacations, they are still sitting and looking out for a job. This will depress them even further. For a person who is a grown up and is a professional, people who meet them will interact with them. They will ask them a question at time i.e. “What do you do?” This will be really embarrassing for the person who is unemployed at the moment. They will struggle to answer such a question to the person. The person who will know that this is one of the most asked questions by the other, they will start preparing for it in their mind. And eventually they will start stressing out about the situation and it will turn into depression for not having a job. Prevention before such a situation arises is always the best solution for the individual. But the main thing that the person needs to do would be to keep a track of all such feelings so that they can be kept under proper control. Certain tips on how to fight depression and how one can prevent such a situation arising has been mentioned below. 1. Printing out a list is one of the best ways of handling such a situation Of all the above mentioned causes printing out a list via any excel or office version is the best way to manage all the problems. This will help the person in managing the depression problem in a much better way. 2. Keeping a scale to rate each and every problem is also helpful. Rating each cause on a scale of 1 to 5 with 1 being very little and 5 being a lot is also helpful. It helps the person in knowing which cause is affecting them the most and which is affecting them the least. 3. The person should always be free if they want to add any more causes they possibly think are there. Such causes will only help them in solving their problem, if any other cause comes in their way later on in the future. 4. The list should be prioritized. All priorities should be sorted out in such a way that the most difficult and worse causes should be at the start. All causes should be written in the decreasing order. 5. When the list has been prepared and prioritized, the person should try and block each cause if they can. It can be done if the person starts to imagine all such actions which have been mentioned in each individual cause. Then they must try and use these causes to block out the other cause. 6. Starting from the clauses top of the person’s list, they should try and recommend certain actions to solve them as quickly as possible. And after recommending these actions, they should carry out a follow through. 7. After every single month has been passed by, the person should keep some time available aside. This is for the purpose to evaluate and look over how things have gone about. It will also make them realize what other estimations are needed and why things aren’t working in their favour. 8. After doing this, they can fill in new ratings as per the current day and date. Then the sorting can be done and certain new actions used for blocking can be chosen by the individual. For a person to have a job, it is not necessary that they should go into a job search depression. If they start realizing that they are going into a problem, then they must try and avoid it and find a solution.